Line two baking sheets with parchment paper. Preheat the oven to 250. Toss all ingredients together. Make sure the nuts are evenly coated. Arrange in a single layer on one of the baking sheet and bake 40-45 minutes, or until the peanuts look mostly dry, stirring every 10 minutes. Remove from the oven, and allow to cool on the remaining lined baking sheet. Can you tell I made a lot of nuts this year? These are one of my favorites; the flavor is somewhat unexpected and the coconut toasts along side the nuts so it is super easy. Since they can be made days ahead, these nuts would make a flavorful but not spicy-hot snack to serve at a cocktail party instead of mixed nuts. I also think they would make an inexpensive but impressive hostess gift. Preheat oven to 350. Bring a large pot of water to boil. Boil the lasagna noodles until almost al dente. Arrange the boiled noodles in a single layer on cookie sheets until assembly. Meanwhile, stir together all of the cheese filling ingredients until uniform. Set aside. Then, heat the oil in a large saute pan and add the onions, garlic, carrots and mushrooms. Saute until the vegetables are soft. Add the tomatoes and turn the heat down low. Simmer for at least 1 hour. You can cook it longer if you have the time, the flavor improves with more cooking, but an hour yields a perfectly tasty sauce. Ladle some of the sauce in the bottom of lasagna pan. Arrange the noodles in a single layer, overlapping as necessary. Spread with the cheese mixture and top with more sauce and another layer of noodles. Repeat until the pan is full, reserving some sauce to coat the final layer of noodle. Sprinkle with parmesan. Cover in foil and bake 45 minutes. Remove foil and continue to bake 15 additional minutes or until bubbly and hot. Allow to sit 5 minutes before serving. *AKA broccoli rabe, rabe, broccoli raab, it is nearly identical to Chinese broccoli. Lasagna is always a favorite but sometimes it gets a little boring. This time we eliminated the meat sauce and used one of Matt's favorite vegetables, rapini. Rapini can be on the assertive side (some might say "bitter") but I really like it. The flavor is also tempered by the tomato and cheese. Preheat oven to 350F. Grease and flour one bundt pan. In a large bowl, cream the butter, zest, and sugar together until fluffy. Add the egg, juice and sour cream, stir to combine. In separate bowl, Whisk together flour, baking powder, baking soda, poppy seeds, baking powder and salt in a large bowl until well combined. Add to the wet ingredients and mix until a uniform batter forms. Fold in cranberries. Pour into prepared pan. Bake 55 minutes or until a thin knife inserted in the middle comes out clean. Cool 5 minutes on a wire rack, then remove from the pan. Cool completely. *Freshly squeezed tastes the best and you're going to need the zest anyway. I got 1/2 cup of juice out of one large orange. This year was the first year I've ever made something for Christmas. We are not big Christmas people and my mom generally handles all of the cooking for our small family Christmas Day early dinner but this year she mentioned she wasn't sure what to make for dessert so I offered to make something. Then on Christmas Eve eve I suddenly came down with a fever-101.6. I almost called her to cancel dessert but I decided instead to look through some old recipes while I was in bed. I found a recipe for a orange poppy seed quick bread that I made years ago and liked so I decided it cross it with a lightened up version of old family favorite that had put in many a Christmas appearance and make something entirely new. Adding cranberries seemed appropriately festive and resulted in a cake that was just sweet enough. Thanks to the orange juice and sour cream (which I cheated a little and used Daisy light sour cream to no ill effect, I find it the thickest and most like "real" sour cream out of the low fat sour creams) it is a very moist and flavorful cake. Of course I am still sick and am not participating in the festivities (my mom is stopping buy later with some food and I will send some cake home with her) but I am glad I took the time to make the cake, it is one of my new favorites. Line a baking sheet with parchment paper. In a small bowl, whisk together the sugar and spices. Set aside. In a heavy pan, heat the honey until boiling. Add the nuts and cook 3-5 minutes or until the honey has mostly disappear and what is left is golden. Remove from heat, stir in the the spice mixture. Pour on to the baking sheet and arrange in a single layer, separating the nuts from each other. Allow to cool completely. Store (flat if possible) in an air tight container. A twist on the classic honey roasted nuts. I made these for Matt who loves honey, cardamom and peanuts. They were pretty easy to make except I will say that it is important to separate the nuts as soon as they come out of the pan and to allow them to cool completely unless you want clusters. Line 2 baking sheets with parchment paper. Beat the butter, salt, sugar and vanilla until smooth and fluffy. Add in the flour, one cup at a time, until a dough forms. Fold in 1/2 cup the chips. Preheat oven to 350. Cover and refrigerate the dough until firm, about 20 minutes. Then, working quickly, shape heaping tablespoons of dough into 3 inch by 1/2 inch thick logs by rubbing them between your hands. If the log breaks, fold it over and roll again. If the dough in the bowl gets too soft to handle as you work, refrigerate it until it is firm again. Place cookies on the lined cookie sheets about 1/4 inch apart. Bake 8-10 minutes or until the bottoms are golden brown. Remove to wire rack to cool. Slide the the same parchment paper under the racks. While they are cooling, melt the chips over low heat in a small, heavy pot. Stir to incorporate any unmelted chips. 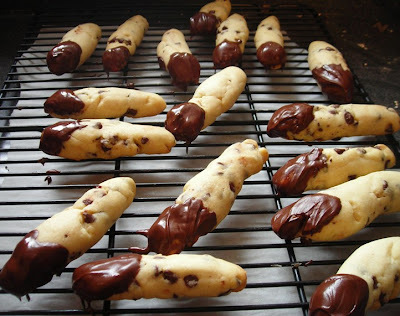 Immediately dip 1/4 of the cookies into the melted chocolate. Return to wire rack until the chocolate is set, about 20 minutes. Store in a single layer in an air tight container. *Use regular sized chips if you must, but they are really too big and bulky for this recipe. This is a recipe I got from my mom. I tweaked it a bit to make the directions it clearer but it is still the same basic recipe we made when I was younger at Christmastime. I don't generally make such rich cookies (2 sticks of butter!) but these are really good, so I made an exception. I always thought of them as rather fiddly little cookies but they are actually dead easy. I think the downtime is what bothered me but it really isn't too bad and the ease of making the cookies more than makes up for it. There is no need to temper the chocolate, and no egg or leavening. These are a good, crisp shortbread without being too crumbly and the chocolate really makes them special. Preheat oven to 350. Line two baking sheets with parchment paper. Place the flour, baking powder, salt and sugar in a food processor. Pulse until well mixed. 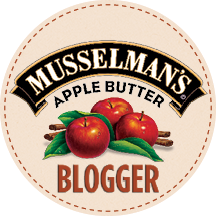 Add the butter and pulse until it is incorporated but the mixture not totally smooth. Add the milk and egg and pulse until the dough comes together into a somewhat sticky mass. Remove to a floured surface. Knead slightly and sprinkle with additional flour if the dough seems overly sticky. Roll out into a rectangle about 1/4 inch thick, about 12x14 inches. 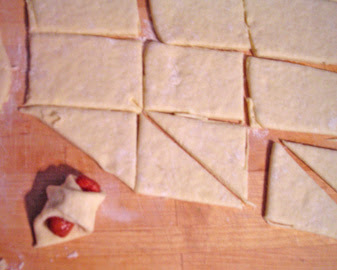 Slice the dough into approximately 12-15 squares. Cut each square in half diagonally. Place the triangle of dough so that when it is facing you, it looks like a pyramid. Place the sausage in the middle and fold each narrower point over the sausage in a criss cross fashion. Place on a baking sheet. Repeat for remaining sausages, placing them about 1/4 inch apart on the baking sheet. Brush with the beaten egg and sprinkle with sesame seeds if desired. Bake 12-15 minutes or until the dough has puffed and the bottoms are golden brown. Serve hot. *I used a 14 oz pack of beef Hillshire Farms Lit'l Smokies (is that an embarrassing product name or what?) and had some leftover. Honestly, any small sausage would do. 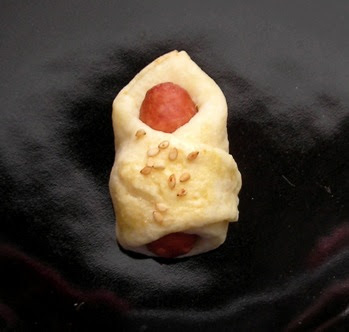 After doing a quick Google search I found out some interesting things about the ubiquitous appetizer pigs in a blanket. First, most people seem to use cans of biscuit or pizza dough or crescent rolls. Which, to me is a mistake, making, rolling and cutting out the dough only took about 10 minutes, tastes much better and has none of those icky chemicals they put in commercial refrigerated dough. Secondly, pigs in a blanket are not sausages wrapped in biscuits in all parts of the world. Some times they refer to meat wrapped in cabbage, or sausages wrapped in bacon. 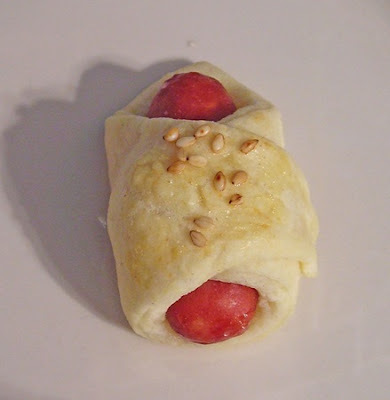 Thirdly, pigs in a blanket are some times called franks in the jackets or biscuit dogs. Biscuit dogs! How cute is that? I do sort of think the pigs in blankets name is a bit of a misnomer, the biscuit does look like a blanket but when I've had them, the sausage is normally beef, not pork. Anyway, last night I suddenly had a craving for pigs in a blanket. Which is a little odd, as I normally don't eat them in party situation much less on a random Friday at home. Matt was game and picked up some sausages on his way home from work. He even offered to mix the dough since I wasn't feeling well. 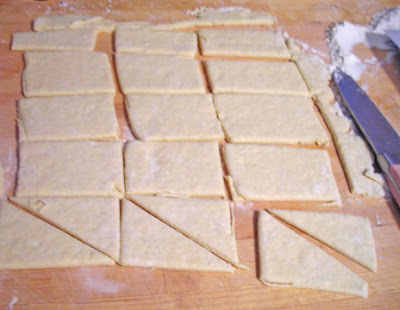 We decided on our favorite biscuit recipe and about 5 minutes later the dough was rolled out and I started slicing. It only took a few minutes wrap all of the sausages and place them in the oven to bake. And when they came out? Crispy, tender and delicious. Much better and fresher tasting than the frozen or crescent-wrapped ones I've had in the past. So, maybe for your next party, you'll take a couple of extra minutes and make them from scratch. You'll be glad you did. Line two baking sheets with parchment paper. Preheat the oven to 250. Toss all ingredients together except for the salt. Make sure the nuts are evenly coated. Arrange in a single layer on one of the baking sheet and bake 25-35 minutes, or until the peanuts look mostly dry, stirring every 5 minutes. Remove from the oven, sprinkle with salt and allow to cool on the remaining lined baking sheet. Tip: Set the oven timer for 5 minutes, stir the nuts. I (carefully!) reached in the oven and tossed them with a spatula then set the timer again until 30 or so minutes were up. I made these for our neighbors who, by the wafting scent of their Old Bay redolent crab feasts they host each year, like things a little bit spicy. The sugar provides a nice sweet component and helps the spices stick to the nuts. This was Matt's second favorite of the 6 kinds of nuts I made this year. I have to admit, I only had a couple (after a marathon day of nut flavoring I was in nut overload) but they were very good, just the perfect middle ground between sweet and spicy. The five spice powder was a great idea if I do say myself, it gave a complex flavor to the nuts without having to measure tiny amounts of spices. Line a baking sheet with parchment paper. Place the nuts, brown sugar and vinegar in a heavy sauce pan. Cook over medium heat, stirring occasionally, until their is no liquid left and the sugar has dissolved, about 5-8 minutes. Add the salt and chile powder. Stir until dissolved (about 30 seconds) then pour the nuts on the the prepared pan and quickly use a spatula to separate the nuts into one layer, no touching. Cool completely before eating. *I used skin on, but blanched would probably work just as well. This year I decided to make flavored nuts to give as gifts. However, this first recipe was all for me. Look for several new recipes in the days to come. These are perfectly caramelized almonds with a secret. I love that the candy shell that envelopes the nut is not too sweet and not sour at all- just right. I honestly have never been much of a nut** person, but I wish I had made two or three times the amount I did. Bring a large pot of salted water to boil. Boil the noodles until al dente, adding the frozen spinach in at the last minute or so. Drain. Meanwhile, in a hot pan, fry the bacon until crispy. Drain on a paper towel lined plate and cut into bite-sized pieces. Place all ingredients in a large bowl. Stir to evenly distribute the mayonnaise, balsamic vinegar. Serve at room temperature. Refrigerate leftovers. *I used dry (i.e. not oil packed) sun-dried tomatoes so I just tossed them in with the pasta during the last minute or so of cooking, just to plump them up a bit. If you are using oil packed tomatoes, blot them before use. Yield: approximately 6-8 main course servings. Note: The whole salad can be prepared the day before serving with great success. Winterizing isn't just for summer homes and vehicles anymore. I had my mother and grandfather over for lunch today and I wasn't sure of what to make until the last minute. I wanted to make something that would be substantial enough to stand alone (no side dishes!) and that hopefully result some leftovers for tomorrow's lunch. Last night my husband sauteed a chicken breast (with some shallots and a basic marinade) for his lunch today so I had him to saute me some extra in case I wanted to use it in something today. This morning I was looking through some recipes and found one for BLT chicken salad sandwiches. The recipe sounded good if a bit mayo-heavy. The problem was that we only had 4 slices of bread in the house, I wouldn't eat a fresh tomato in December if you paid me and I don't buy lettuce in the winter. So that was out. But I liked the concept so I started from scratch and made a winterized pasta salad using some of the flavors of a good BLT but using high quality frozen and shelf stable ingredients instead of a bunch of out of season vegetables. Which isn't to say the pasta isn't fresh tasting, the flavors are clear and bright, only that you don't have to wait until Summer for a good pasta salad. Check out my spring (with asparagus and lemon-thyme dressing), autumn (with apples and apple cider dressing) and summer (with carrots and cucumber) chicken pasta salads as well! Whisk together the egg, molasses, butter, sugar and buttermilk in a small bowl or measuring cup until smooth. Set aside. In a medium bowl, whisk together all of the spices, flour, baking soda and baking powder. Slowly whisk in the egg/milk mixture. There should be no pockets of unmixed flour or large lumps. Batter will be rather thick. Allow the batter to sit while you spray a frying pan or griddle with nonstick spray or melt 1 tablespoon of butter to coat. Heat the pan so that it feels warm when you hover your hand over it. Add about 1/4 cup of the batter into the middle. Cook until bubbles begin to appear and pop. Flip. Cook for about 2 minutes. Both sides should be golden brown. Yield: about 5-6 mid-sized pancakes. This morning I had the yen for gingerbread pancakes. Not that I had ever had them before, but they sounded tasty and seasonal. I didn't think I'd have to make up my own recipe for them, but after seeing what was out there I thought it was best to start from scratch. I wonder if the recipes I found for gingerbread pancakes derive from one source* because the vast majority of them call for somewhat odd-in-a-pancake-recipe ingredients like water and coffee. This frankly doesn't seem to make much sense to me because, well, water is just water-thin and tasteless and coffee, except when used in tiny amounts with chocolate, has a tendency to make everything taste like coffee. I wanted the pancakes to have a rich, full gingerbread flavor with the texture of a traditional American pancake. 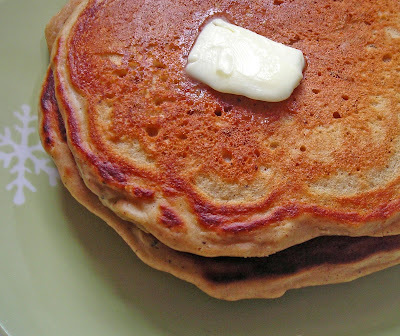 It made more sense to me to use buttermilk as the sole liquid, it added some depth of flavor and its reaction to the baking soda make the pancakes light and fluffy. I kept the molasses (which strangely, most recipes didn't call for, isn't molasses one of the key flavors of gingerbread in cake or cookie form?) to a minimum because I don't really care for it, but I thought the pancakes needed that background of flavor to really taste gingerbread-y. Not to mention the fact that too much molasses would result in a very sticky batter that might caramelize on the pan. I added some gingerbread spices to the flour and I was done. The result: light fluffy pancakes with the authentic flavor of gingerbread. *Perhaps the Magnolia Cafe in Austin? They seem quite renown for their gingerbread pancakes, even my husband has had and enjoyed them there. Directions:In shallow, heavy pot, heat the butter and chips over low heat until melted. Stir to occasionally. Remove from heat and stir in the condensed milk and candy canes until the mixture is smooth and uniform. Pour into a buttered 8x8 inch baking dish and allow to cool 15 minutes. Then refrigerate the fudge for 2 hours or up to overnight. Unmold (if it sticks, run the point of a knife along all four sides and slide a thin spatula underneath to remove) and cut into 1 inch squares. Store at room temperature in an air tight container. *Since chocolate is the focus here, using good chips is essential. I used Guittard which melts well and seems to have less additives to hold the "chip" shape than other brands. **I hit the candy canes with something heavy while they are still in the wrapper to crush them without creating a sticky mess or having to use a separate plastic bag. Note: I do recommend storing anything made with peppermint in a separate container from anything else because over time, the mint flavor will permeate other foods. When giving candy or cookies as gifts, I always pack anything with peppermint candy, chips or extract in a separate tightly sealed bag or container. I created this recipe as sort of an homage to peppermint bark. Mostly creamy dark chocolate, the fudge is studded with bits of candy cane. Even people who are not too fond of peppermint like this fudge, the peppermint flavor isn't overwhelming and the candy bits add an interesting texture contrast. If you are a candy cane fanatic, you might want to increase the amount of candy used, but I wouldn't add more than 1 or 2 additional canes or the fudge gets too chunky and chewy. There are many different ways to make fudge and this is one of the easiest. 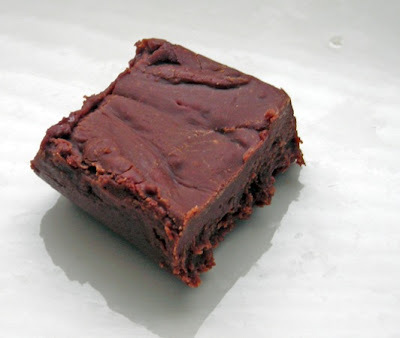 I used to make fudge the more involved way with sugar, hand chopped chocolate, corn syrup and heavy cream but years ago I did a taste test and it turned out that people liked the flavor and texture of chocolate fudge made with condensed milk just as much or more than the more time consuming fudge. I do use different methods when I make other flavors of fudge but for this one, this recipe is just right. A while back I created a Facebook page for Coconut & Lime and I just realized I never posted about it. So, if you are on Facebook and want to sign up as a fan of C & L, go ahead! You can even post pictures of foods you've made from my recipes, which I know some people have expressed an interest in. In tangentially related news, my husband's aunt (my aunt-in-law?) has started a internet dating site with a twist-style dating. You can meet people who have similar style and taste as you do. She's based out of LA, but they have members from all over the world. Her site, Casagogo.com is one of this week's sponsors of Coconut & Lime, so go over to the right side column and check it out. Oh and speaking of LA, recently I was interviewed by a reporter for the LA Times in an article about saving money while grocery shopping. Many of my tips including shopping for staples while they are on sale near the holidays and menu planning were featured. Read the article here. Heat a pan large enough for a large tortilla to lay flat. Place one tortilla in the pan and heat until warmed through and slightly browned, flipping once. Repeat. Remove from heat. Sprinkle one tortilla with a thin layer of cheese. Top with a thin layer of spinach. Add the shrimp, avocado and chorizo in a single layer on top of the spinach. Dot with salsa if desired. Sprinkle the whole mixture with more Monterey Jack. Make sure that you get a good sprinkling of cheese on both sides of the filling, this will keep your quesadilla from falling apart. Place the second tortilla on the top of all of this and return it to the pan. Cook until the cheese has melted, spinning it occasionally around the pan with your finger tips, and the bottom is slightly browned, about 1-2 minutes. Carefully flip it and cook it on that side for an additional 1 minute. Remove to a large plate and slice (a pizza cutter works well) into wedges and serve with sour cream to dip. 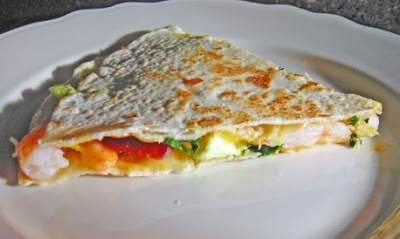 My husband is normally the quesadilla maker in our house but we had some shrimp and chorizo on hand and I remembered a quesadilla I had out years ago that used just those ingredients. Now when Matt makes a quesadilla, he always, always uses homemade refried beans. He was skeptical when I told them I was making a quesadilla sans beans, but I swear, it works. The cheese is all you need for the whole thing to stick together. While I love refried beans on chicken or steak 'dillas. I think they are a little overpowering when you are using shrimp. He also was skeptical about my refusal to saute the chorizo before layering it in, but I really think that is an unnecessary step. Chorizo is already cured and if you slice it thinly, it will cook through while it is sandwiched between the tortilla. Anyway, this is a quick, easy (if somewhat nontraditional) dinner recipe. I also want to point out that I used Spanish style chorizo, not Mexican chorizo. They are two very different products. Do not substitute one for the other. Preheat the oven to 350. Line 2 cookie sheets with parchment paper. 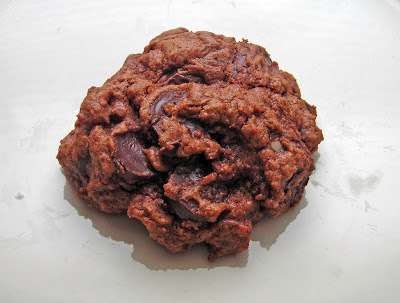 In a medium sized bowl combine flour, cocoa salt, and baking powder. In a large bowl, cream the butter and sugars until light and fluffy. Add the egg and vanilla and combine thoroughly. 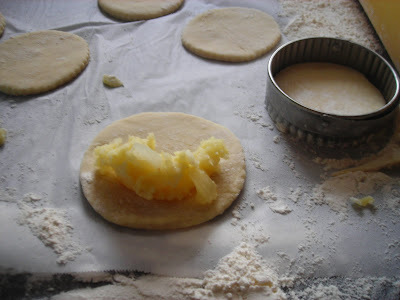 Gradually add the dry ingredients to the sweetened butter and mix until a very thick dough forms. Use a spoon to fold in the peppermint and distributing them evenly. 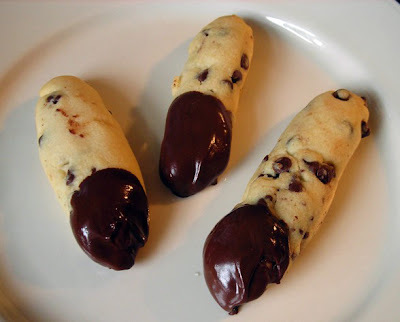 Form cookies by dropping 1 teaspoon of dough on the sheet two inches apart. Flatten slightly then bake until light brown, about 12 minutes. Remove to a wire rack to cool. *These are not simply mint chips, or the miniatures they sell individually wrapped in a bag, they are a little smaller than a dime and are made especially for baking. They have a dark chocolate shell and mint cream inside. If you can't find them, I would think the best substitution would be finely chopped York Peppermint Patties. It wouldn't be a perfect substitute but I think it would come the closest. My mom bought me a bag of these mini York Peppermint Patties for baking. Not only are they super cute, they are easy to work with, you can just treat them like you would a chocolate chip. The cocoa in the cookie itself helps keep the mint from being too overwhelming, but don't worry, they are full of mint in every bite.They are also just slightly chewy for that perfect brownie-cookie hybrid effect. As a side note: I baked some of these cookies in my new Infrawave Oven. It has a cookie setting (!) and a handy feature that converts the time that a recipe calls for baking in a traditional oven (like above) to what is needed in the faster cooking Infrawave. I like it because it frees up my oven for larger items when I am doing a lot of cooking/baking and (unlike a microwave) it actually bakes, browns and crisps things. 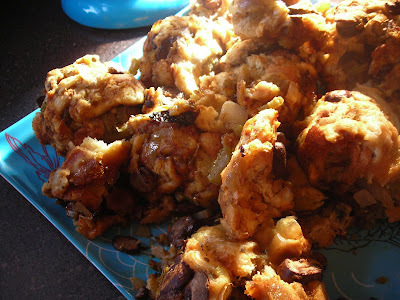 I also plan on submitting this recipe to Food Blogga's cookie event. There are already so many wonderful cookies up! Place fish in single layer in a shallow bowl or tray, squeeze lemon juice over the fish. Refrigerate for 30 minutes. On a plate, mix together flour, corn flour, cornmeal, Old Bay, chipotle pepper, salt, pepper and celery seed. Dredge the fish (both sides) in the mixture then place on a place and refrigerate an additional 1/2 hour. Meanwhile, heat enough oil to pan fry in a large, shallow pan. Heat the oil. Fry fish fillets in the oil, for about 4 minutes on each side, depending on thickness. Make sure the fish is cooked through. Drain on a paper towel lined plate and serve immediately. It is traditional during Hanukkah to eat fried foods, normally latkes, but we were a little short on potatoes so we fried up some fish instead. 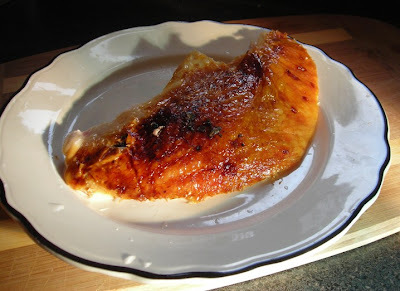 It is sort of an evolution of previous catfish recipe, cornflour replaces some of the plain flour and the spices are slightly different but it is just as crisp and delightful. I could eat it every day. I served it with and drinking my new favorite beverage-Fever Tree Bitter Lemon which add a good tart contrast to the spicy fish. Oh, and we bought something at Ikea that has changed our lives. A mesh splatter guard. It keeps the oil from splashing everywhere when you fry. It also works great when you make tomato sauces. Preheat the oven to 350. Grease and flour or line 6-8 wells in a cupcake pan. In a large bowl, cream together butter and sugar until light and fluffy. Add egg, vanilla, zest and milk beat well. Add the flour, baking powder and salt. Beat until the batter is light and fluffy. Fill each well 2/3 of the way filled. Bake approximately 15 minutes or until a toothpick inserted in the middle of the middle cupcake comes out clean. Cool on a wire rack and take a small corer, knife or melon baller and scoop out some of the center of the cupcake. Fill with jelly (I just spooned it in). Sprinkle with powdered sugar. 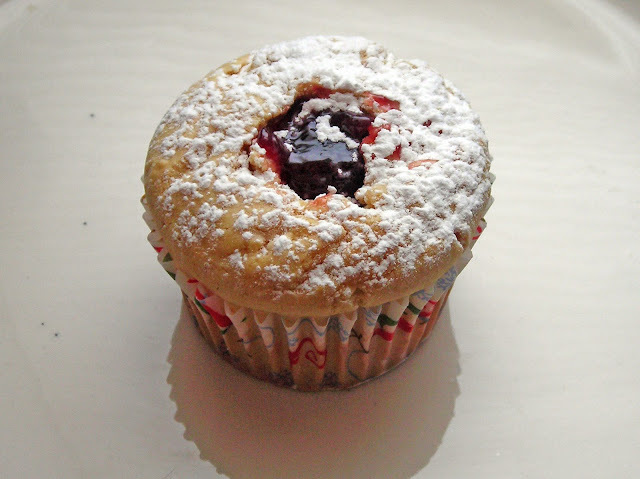 I've been toying with the idea of making a jelly doughnut cupcake for a while. I knew what it would have: a soft vanilla dough, a touch of confectioners' sugar but I never quite got around to making them. When I finally did, it was a relief. They came out just as I hoped, tasting surprisingly like a doughnut and not too sweet. And they were surprisingly easy to fill with jelly. I skipped the pastry bag and just scooped a tiny amount of jelly into the hole and then added more if needed. Easy peasy. While not strictly traditional in cupcake form, jelly doughnuts called sufganiot are a Hanukkah treat that is especially popular in Israel. I thought about making sufganiot the traditional way with a yeast dough and uh, as a doughnut but I just didn't have the time for the two rises and the frying. I do realize that turning it into a cupcake skips over the whole deep fried aspect of Hanukkah foods (the custom of eating fried foods is in commemoration of the miracle of Temple oil) but they are a bit healthier for you and just as much fun. Not to mention the fact that you can eat them after the latkes and not feel quite as guilty for indulging in two fried foods in one day. Beyond Hanukkah, I think these would be especially fun served at a bunch- dessert and breakfast all in one. In a medium pot, bring the broth to a boil. Add the grits and stir continually** for about 10 minutes or until all the broth is absorbed. Remove from the heat and stir in both cheeses. Keep covered until ready to serve. Meanwhile, fry the bacon in a large skillet until crisp, then drain on a paper towel, set aside. Leave about 2 tablespoons of drippings in the skillet. Add the shrimp and saute for 1 minutes, then add the garlic, lemon juice and celery. Cook until almost totally pink and cooked through, then add the spinach and green onions. Cook 2 additional minutes or until the shrimp is totally cooked and the whole mixture is hot. 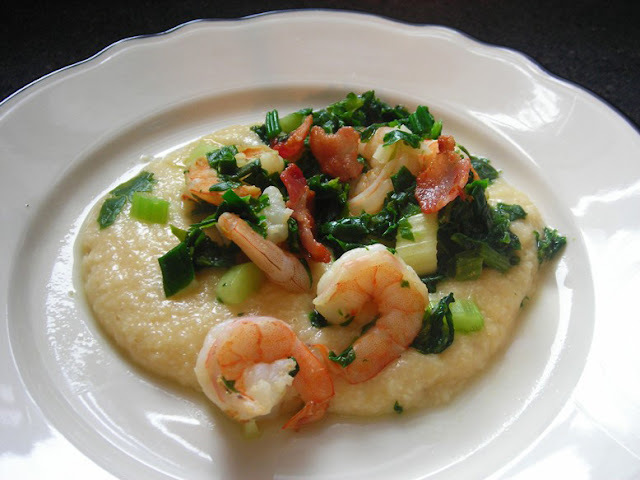 To serve: arrange some grits on a plate, top with the shrimp mixture. Sprinkle with the leftover bacon bits (optional) and serve hot. *If you can't find grits, try substituting some stone ground polenta. Polenta is made with golden corn and grits with white corn (or hominy or a combination of the two) but they are very similar. Purists might tell you different, but if it is a matter of not making the recipe due to a lack of grits and you have polenta-use the polenta. **Well, fairly continually anyway, you don't want lumps. The trick is to have all of you ingredients ready to go, so while you are making the grits, you can make the shrimp part at the same time with minimal interruption to your stirring. Or better yet, draft someone to stir while you do the rest. Grits are not something I grew up eating, but after having them a few times, I was hooked. Even though Maryland is south of the Mason-Dixon, it isn't exactly grits country. You can find them on the shelves without much trouble, but they are not a staple like they are just a few states away. For this recipe, I combined all of my favorite ways to eat grits: under shrimp and cheesy into one perfect meal. I added more vegetables that I've typically found in shrimp grits to make it more of a complete meal, but I think that both those new to grits and devotees will be satisfied. The grits are cheesy but not so much that they overpower the delicate shrimp. You can skip the whole bacon part but it really does add a smoky flavor that is wonderful. Just saute the shrimp in a little olive oil instead. I will say that not only is it an exceptionally tasty dish, that despite the cheese and the bacon, it is very light tasting meal. Preheat oven to 375. In a large pan, saute the red pepper flakes, garlic and artichoke hearts for 2-3 minutes or until fragrant. Stir into the cooked pasta. In the same saute pan, quickly brown the panko. Remove from heat and stir in the paprika. In a large casserole, sprinkle some cheese, top with pasta repeat until all of the cheese and pasta is gone, taking care to end with cheese. Pour the milk over the top. Sprinkle with panko. Bake covered for 20-20 minutes then uncovered for an additional 10 minutes to brown the top. Serve hot. 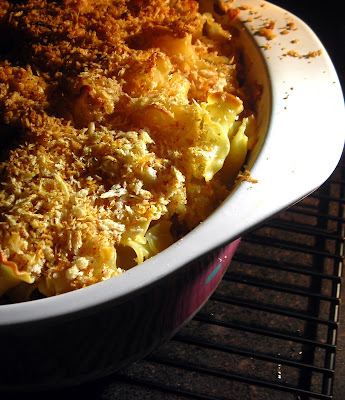 What better food to have on a cold day than macaroni & cheese? 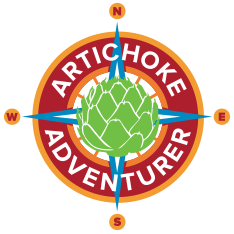 To make this one a little special, I added some sauteed artichoke hearts and used Matt's favorite, asagio cheese. Heat the oil in a large pan. Add the onion, cauliflower, broccoli and saute until softened. Meanwhile, bring the broth to a boil then add couscous and simmer, covered, for 20 minutes. Toss the vegetables with the couscous, lemon juice and zest. Serve hot or cold. After some heavy meals, a light vegetable-based dinner seemed in order. The flavors are simple, but it is a fairly filling dish this tasty served hot or cold. Israeli couscous is a fun alternative to pasta, rice or ordinary couscous, it is larger (sort of the size of large pearl tapioca) and slightly chewy but has a neutral flavor that absorbs broth and other flavors well. First, saute the onions in the oil until translucent. Mash the potatoes, milk onions and egg together. Set aside. In a large bowl, mix together all of the dough ingredients until a round ball forms. 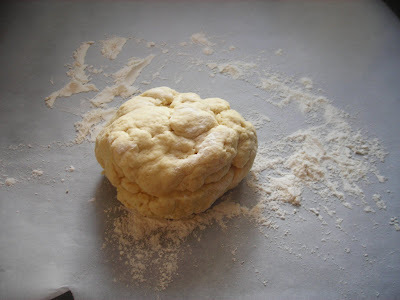 If it is overly sticky, add a little bit for flour, if crumbly, add a tiny bit more water. Roll out on a clean, floured surface. Roll about to about 1/8 thick. 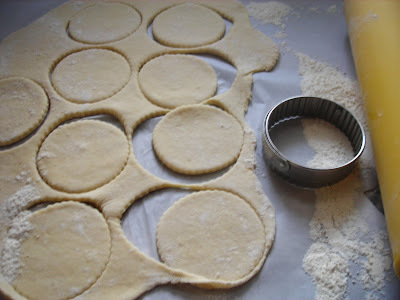 Use a large round biscuit or cookie cutter to cut out circles. 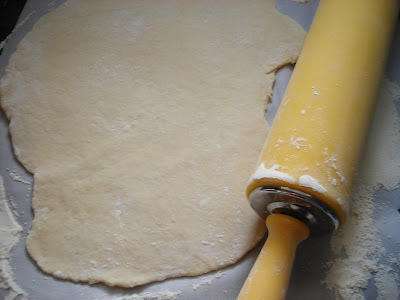 Place 1 1/2 teaspoon of filling on one side of the round of dough leaving a 1/4 inch rim around the bottom. Fold the other side and pinch tightly shut. Bring a large pot of water to boil. Add the pierogi and boil until they float to the surface. Remove and serve or saute briefly in some butter, just to brown them, before serving. Serve hot. Yummy with sour cream and sauteed onions. Today I had one of those "why haven't I done this before" moments. Pierogi** is something I actually I grew up eating (albeit not homemade) unlike 90% of what I post here but for some reason it always seemed like too big of a deal to make on my own, from scratch. Then today it hit me what a silly excuse that was. We've made har gow*** which was very time consuming to make and required a special trip to the market for tapioca flour and wheat starch to make the wrappers. The humble pierogi uses only the most basic of ingredients and is much simpler to make once you get past the fact that you have to vigorously boil something that you pinched together yourself. It only took about 10-15 minutes to make the filling and the dough, roll it out and fill it. Having a stand mixer helped, but even if you couldn't mix and saute at once, it still only take about 20 minutes prep. 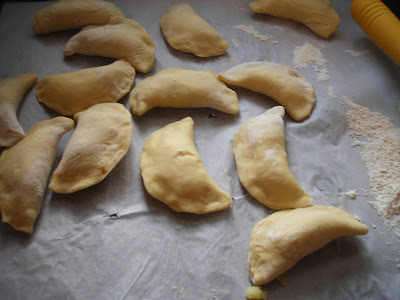 Every culture seems to have a dumpling and pierogi (singular: pierog) is one of simplest, but also one of the most satisfying to eat-they are so filling, just a few pierogi can make a meal. *I used baked potatoes because it eliminated a significant hands on time in making the filling. I didn't have to peel or chop the potatoes, wait for water to boil etc but you could just use plain mashed potatoes. **Alternatively: perogi, perogy, pirohi, piroghi, pirogi, pirogen, piroshke or pyrohy. ***Shrimp dumplings with thin, translucent wrappers. In a bowl, mix together all of the burger ingredients by hand. Do not over work the meat. Gently form into 4 patties. 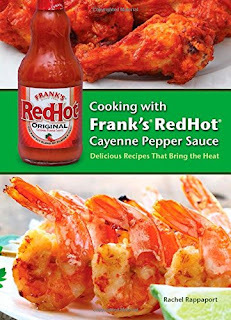 Spray with cooking spray or add 1 tablespoon oil to a large skillet. Heat, then add the burgers, cooking 2-4 minutes on each side. Place on rolls, top with dressing and serve with celery sticks. My husband loves wings although we rarely have them. We've made them at home but it is a fair amount of work for something I personally I am not too fond of. I appreciate the idea but gnawing tiny bits of chicken off a teensy bone just isn't my idea of a good time. Enter the burger-all of the flavor if buffalo wings but none of the fuss. Preheat oven to 350. Line or grease and flour 6 wells in a cupcake pan. In a large bowl, cream the butter and sugar. Add the egg and vanilla, mix thoroughly. Meanwhile, mix together the cocoa powder, espresso powder and milk in a small bowl or measuring cup and set aside. Add flour, baking powder and salt to the butter mixture. Add the milk mixture to the rest of the batter and beat until well combined. Fill each well 2/3 of the way full. Bake 12-15 minutes or until a toothpick inserted the center of a cupcake comes out clean or with just one or two dry crumbs. Cool briefly in the pan, then remove cupcakes to wire racks to cool completely before icing with peppermint cream cheese frosting. Ice, then sprinkle. *I bought this at our local Italian grocery but I have seen it in most regular grocery stores in the coffee isle. It's that time of the year again- everyone is rhapsodizing about peppermint mochas from Starbucks. I admit, I am not a coffee drinker by any stretch of the imagination, but even I make an annual trip to Starbucks to get one. This year I thought it would be fun to combine those flavors into a new portable form: cupcakes. This recipe makes 6 cupcakes, which is a perfect number for a snack with friends, but can be easily multiplied to make more. The cupcake strikes a perfect balance of chocolate and coffee and the icing just elevates it to a whole new level. Preheat oven to 350. Line 2 cookie sheets with parchment paper. In a large bowl, cream together the butter, vanilla and sugar. Add the egg, beat until fluffy. Add the flour, baking powder, coconut, salt, nutmeg, and oatmeal. Mix until well combined. Fold in nuts and chips. 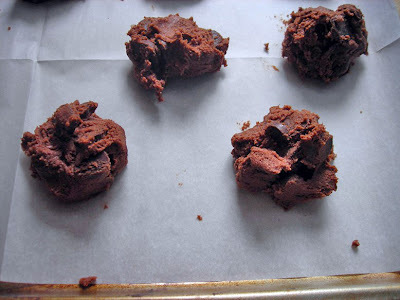 Place 1 tablespoon sized blobs of dough on the cookie sheet (about 1/2 inch apart) and bake for 12-14 minutes or until they look "set" and the bottoms are just brown. Carefully, remove to a wire rack to cool completely. *My mom bought me a bag of these Mauna Loa Premier Baking Pieces: Macadamia Nut Hershey Special Dark chips. It's basically a combination of coarsely chopped nuts and semisweet chips. If you can't find a bag near you (I can't even find a mention of it online, although I know they've been out for at least a year) just substitute a combination of macadamia nuts and chocolate chips to equal 8 oz with your preferred proportion of chocolate to nut. **I find that unsweetened, dried coconut is often sold very cheaply at health food stores. If you can't find it and have to substitute sweetened flaked coconut, you might want to reduce the amount of sugar you use accordingly. These cookies are tropical in that wholesome 1950s way-add some "exotic" ingredients like coconut and macadamia nuts and you are halfway to Hawaii. They are also very, very addictive; even people who had eaten two or three couldn't stop themselves from eating just one more. The coconut was an interesting addition, the flavor was there but because of the oatmeal, there wasn't that slightly stringy texture that coconut-heavy cookies sometimes have. In a small pot, bring the broth to a boil then remove from heat. Soak mushrooms in the hot broth until soft. Remove the mushrooms from the pot. Slice and set aside, reserving the broth. Meanwhile, in a large bowl mix together pork, scallions,pepper, bok choy whites, half of the rice wine, sesame oil, half of the ginger and half of the soy sauce,. Form into 4 patties. Heat a small amount of oil in a skillet and cook the patties for about 5 minutes on each side. Remove and reserve 4 large cabbage leaves. Place the cabbage (whole) lengthwise on the cutting board and slice thinly from point to base and pull apart the pieces to shred. Toss with bok choy and garlic chives. Add some canola oil and a drop or two of the sesame oil to a large pot and heat, Stir-fry the mushrooms, half of the cabbage mixture, and the rest of the ginger, and the remaining rice wine and soy sauce until the cabbage begins to wilt, 1-2 minutes. Add remaining cabbage stir-fry until all of cabbage has begun to wilt, about 3 minutes. Add the broth. Arrange the patties in a single layer and then cover with the reserved leaves. Cover and simmer 20 minutes, then remove the cover and cook an additional 10-15 minutes. Serve with rice. I've always loved lion's head but it isn't always on the menu. I decided to make my own version which is fairly close to what I've had out but with some of my own touches. Typically the meatballs have water chestnuts in them. Something about the texture of water chestnuts is really off putting to me, but I really wanted to maintain some crunch (for texture interest) so I finely diced some of the crunchy bottom of a stalk of bok choy and used that instead. Still a touch of crunch but without the icky texture. I also added garlic chives and the rest of the head of the bok choy to the cabbage. You could also choose to make smaller meatballs, I made four so it was easily divisible: one for each of us for dinner, then the other two were divided up for our lunches. It was really, realy good. Mix all ingredients together until the cabbage starts to leak water. Place in a large, nonreactive container. Pack the cabbage in tightly. There should be enough liquid to cover the cabbage. If not, pour some some brine (16 oz water, 1 tablespoon sea salt) to cover. Weigh down the cabbage* (keeping it below the liquid) and allow to ferment in a cool, dry place for at least 1 week. Check it daily and skim off any scum* that may float to the top. After fermenting, refrigerate in an air tight container. *I put the cabbage in a huge jar with a very wide mouth and weighted down a shallow bowl with a quart bag filled with water to press down the cabbage. It worked well. **I really didn't get any. As I think I've mentioned before, serving sauerkraut on Thanksgiving along side the turkey and mashed potatoes is a longstanding Baltimore tradition. It wasn't until I was in college before I realized that this wasn't something the rest of America did. It just makes sense to have something pickle-y and sour as a foil to the sweet-tart cranberry sauce and creamy potatoes. Or at least it does here in Baltimore. I never gave making sauerkraut from scratch any thought before but I was emboldened by my kimchi success. I did some research but couldn't find a really definitive recipe (I couldn't even find consensus on how much salt to use per pound) so I just gave it my best shot. Basically, sauerkraut is nothing more than fermented, salted cabbage so the margin for error is less than one might think. I added caraway seeds for a more Germanic touch and then waited for about a week. The result: slightly crunchy, perfectly sour, kraut! I feel like a magician. Preheat oven to 350. Line 2 cookie sheets with parchment paper*. In a large bowl, cream together the butter, vanilla and sugar. Add the egg, beat until fluffy. Add the flour, baking powder, salt, ginger, and oatmeal. Mix until well combined. Fold in cranberries** and chips. Place 1 tablespoon sized blobs of dough on the cookie sheet (about 1/2 inch apart) and bake for 12-14 minutes or until they look "set" and the bottoms are just brown. Carefully, remove to a wire rack to cool completely. *I've gotten some questions regarding parchment paper. To answer: yes, it is worth it. Repeat after me: "no clean up". **The cranberries might pop as you mix them in and make a scary sound. That's okay, it doesn't matter if they are whole anyway. I had some cranberries, 1 1/2 cups actually, leftover from making sauce and thought about making cookies. I did some searching and actually couldn't find more than a couple (frankly, unappetizing) cookie recipes that used fresh cranberries. 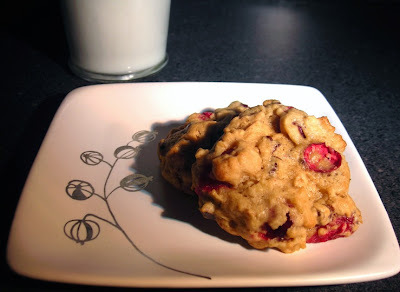 I am no stranger to baking with fresh cranberries, having made more muffins, bread, pancakes, crisps, and cakes than I can list here, so I found this odd. Dried cranberries might have the leg up because they are shelf stable and available year 'round but what about those months when you can use fresh cranberries? Do they not deserve cookies? I briefly wondered if there might be a reason why people aren't making cookies with fresh cranberries but quickly dismissed it. All I needed was about 25 minutes and I'd have my answer, so why not experiment. And I am glad I did. Using fresh cranberries totally works! Of course, this is not a overly sweet cookie (although I was so excited about finding mini chips at the store*** yesterday, I tossed some in) due to the tart nature of the cranberry but sweet enough. And if you close your eyes and take a bite, between all the cranberries and the oatmeal, you can almost think of them as good for you. ***Hershey's semisweet mini chips, which like it seems with all mini chips, are notoriously hard to find. If you're local, Mars is a stronghold. Beyond that I buy them at Chocolate World. Guittard makes mini chips too or so I hear, but they aren't available locally. You can substitute regular sized chips, but the mini ones are great, a tiny burst of chocolate in every bite, without being overpowering. Bring a large pot of water to boil. Add the potatoes and celeriac and cook until fork tender. Drain and return to pot. Add cream, salt, pepper, milk, parmesan and butter. Mash manually. Serve hot. In Alice Waters' wonderful new book* The Art of Simple Food she talks about how potato and celeriac (she calls it celery root) are such a great pairing that together they form a third vegetable. Since I had such success with that gratin (not to mention leftover celeriac) I had to agree. I thought the gratin was good, but this might be even better. I am not normally one of those people loads her mashed potatoes up with butter and cream, but these are voluptuous with just a splash of cream, perfect for a holiday meal. Silky, smooth and oh so tasty. *Seriously, you should run and get this book. I haven't found her older books to be too exciting (I know! I am the only one) but this one is a perfect blend of simple techniques and fresh ideas about food. It would be a perfect gift for a beginning cook (she goes over the basics like making stock, technical terms) but also for those of us who are more seasoned (base recipes for custards, lots of variations, food histories/facts) there is something there too. Preheat oven to 400. Sprinkle the onion and tangerine quarters with sage. Meanwhile, rinse the (empty) turkey off with cold water. Place on the rack and position in the roasting pan. Squirt the turkey with 1/2 tangerine. Rub the turkey with a tablespoon of oil and salt and pepper. Stick 1 1/2 tangerine and the onion inside the empty cavity of the turkey. Arrange 4 quarters around the bird. Squeeze the juice from the remaining tangerine into the bottom of the pan. Roast at 400 for ½ an hour then reduce heat to 325 and continue to roast for about 2 ½ hours, basting with juices from the pan every ½ hour, or until the juices run clear and the leg is easily moved. You may choose to tent the breast of the turkey about ½ an hour in for tender meat. Allow to sit for about 10 minutes before carving. When I make a big meal, I like to come up with flavor themes. It cuts down on the number of ingredients I have to buy and insures that all of the components of the meal come together. Last year I went all out with a apple cider and Madeira theme. This year I kept it a little more simple and used tangerine in the cranberry sauce and in the turkey (which in turn flavored the stuffing a bit). I got the idea for a tangerine infused turkey from those old recipes that call for sticking a lemon inside a chicken then roasting it. This is similar, but in this case, much better-tangerines seem so much more festive and special this time of year. Not to mention the availability of really juicy tangerines this year makes not using them a shame. Re: Brining. I've gotten a lot of emails about brining this year. We've done it in the past, but if you have a good quality turkey, I don't really see the need. It does make the bird moist, but so does buying a good turkey and cooking it properly. And if you aren't careful with the brine, you might end up with a salty, inedible turkey. In a large pan, saute celery, mushrooms and onions in butter until translucent. Do not brown. Add to bread cubes in bowl and add seasoning. Combine with egg and water and form medium sized balls. Place balls in the bottom of the roasting pan underneath the turkey on the rack and around the turkey on the rack for about the last 1/2 hour of baking and cook until cooked through. In my family, we didn't stuff the turkey nor did we bake the "stuffing" in a seperate dish. 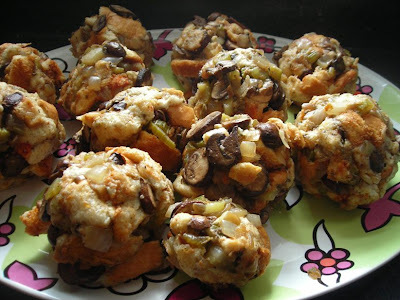 We made stuffing balls. Even though stuffing the turkey is back in vogue (as is stuffing under the skin) it is still my prefered method. The "stuffing" soaks up juices that run out out of the turkey and are individually proportioned for easy serving. Stuffing is my favorite part of the meal, I honestly make a turkey every year (despite going to the in-laws and not cooking on Thanksgiving) so I have an excuse to make tons and tons of stuffing. 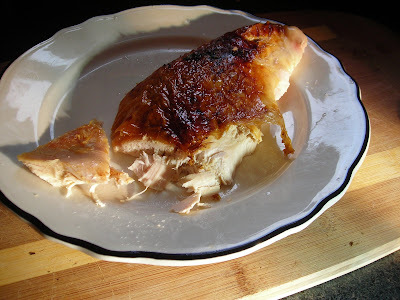 You can also halve the recipe and make it with chicken or cornish game hens.